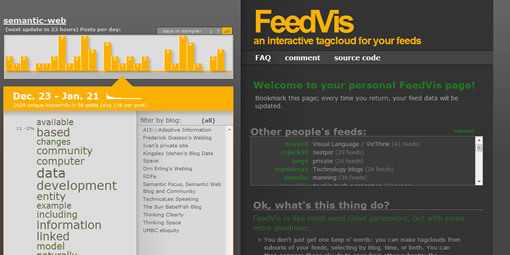 Feedvis is a free service that allows you to track a selected list of blogs in any niche for hot topics. Feedvis currently allows up to 100 blogs to track at any time, you can supply the list of blogs to track in OPML format. Then it will generate an interactive tagcloud from those RSS feeds. Create an account with Feedvis and upload your OPML file, now you can track for the hot topics across all your favorite blogs. The interface is nicely designed with jQuery goodness. Select the date range you want to track, 1 day, 7 days or all time then it will show the hot topics across the blogs. You can also filter tags by blogs, when you select this it will show only tags from that blog. If you click on any of the tags it will the posts related to the tag. Although it works pretty good for tracking a select group of blogs, the algorithm is picking whatever tag it finds (common words like available, based etc..) there should be a way to filter common terms. Perhaps using Yahoo term extraction API or Opencalais may be better option to extract terms from the blog posts. Hey, this is Jason, the guy who wrote FeedVis. I’m planning on adding a way for you to customize your stopword list on feedvis.com. Until then, you can use your own custom stopwords by editing the stopwords.txt file if you install feedvis on your own server.